The clock above is dynamically linked to: https://xkcd.com/1335/. It’s an accurate representation of times around the globe, updating every 15 minutes to stay closely in sync with our spinning planet. Every time I check it, it’s right on. This universal clock is brought to you courtesy of XKCD, brainchild of Randall Munroe. His creation is titled “Now” and was first posted on Feb 26, 2014. This is not a typical map projection. The view is from above the South Pole (so it rotates clockwise), and there’s a fair amount of distortion in the shapes of continents. Nonetheless, I always find my location easily. There are more “sophisticated” global clocks online, but I like the elegance and simplicity of “Now” — and it’s lack of ads. I keep the link on my browser favorites menu. Munroe’s Universal Clock is another great example of science + art. I so liked the design I just had to share it with my readers. 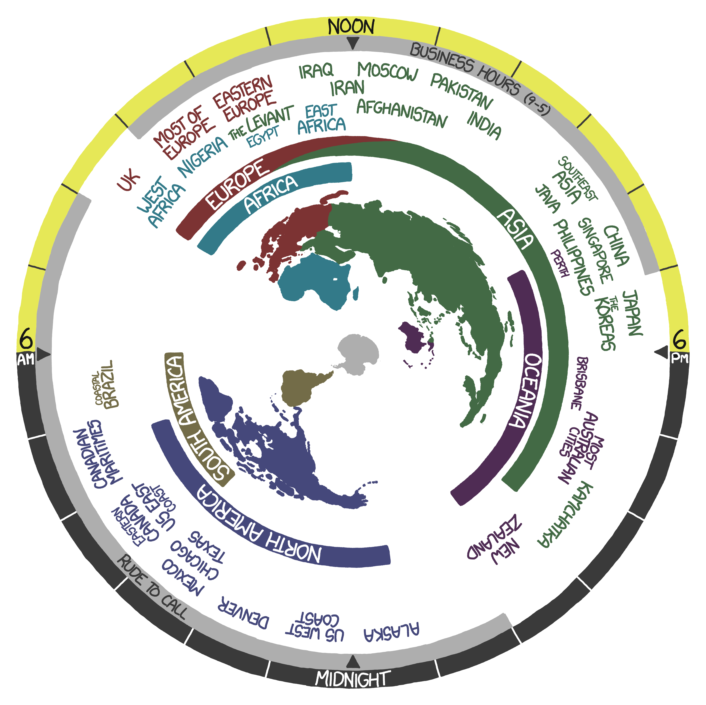 The only improvement I might suggest would be an overlay of light-colored lines showing the radii defining the time zones. I find it easy enough to imagine those lines, trace outward to the perimeter, and read the current time, but some may find that process difficult. Munroe graciously allows reproduction of his content for non-commercial purposes. I thank him for that permission, and for a week off from creating my own material. If you’re a fan of science humor I highly recommend his blog XKCD. The content isn’t always humorous but it’s invariably entertaining. I’ve been an XKCD reader for many years, but admit that I often need to read Explain XKCD to get the joke.